"On one occasion, Brother Juniper was left in charge of the cathedral by the caretaker. (Not sure what he was thinking.) Some beggars came to the door asking for food and money. Juniper had little to offer, but he mentioned that there were some silver bells in the cathedral they could have, since it was God’s house. So he helped them with that. When his superior, the bishop, got word of this, he scolded Brother Juniper. Legend has it he yelled so loudly that he lost his voice. Brother Juniper, feeling remorse for having angered him so badly, made some porridge that night to take to the bishop. He carefully carried it by the light of a candle to the bishop’s house. When his superior answered the door, he was irate, having been awakened from his slumber. He wanted nothing to do with Juniper’s gift. So Juniper, with the innocence of a child, asked the bishop if he would mind holding the candle so Juniper could eat the porridge before it got cold. At this point, the bishop was so taken aback, he fell apart with laughter at the absurdity of this simpleton. He held the candle, and they finished the porridge together." 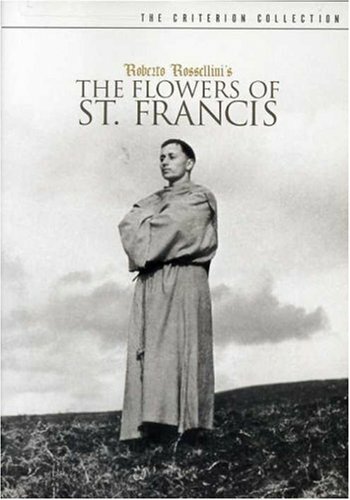 Listen to us talk religion and the responsibilities reformers have to actually acknowledge why reform needed to happen on this week's Lost in Criterion episode The Flowers of St. Francis via iTunes or LostInCriterion.com, and while you're at it, like us on Facebook or support us on Patreon.